Bad weather made us decided to take a tour of the island … it was unfortunately an overcast day with some showers every now and then – which does not make for great photography … but in the end …the experience was quite something! 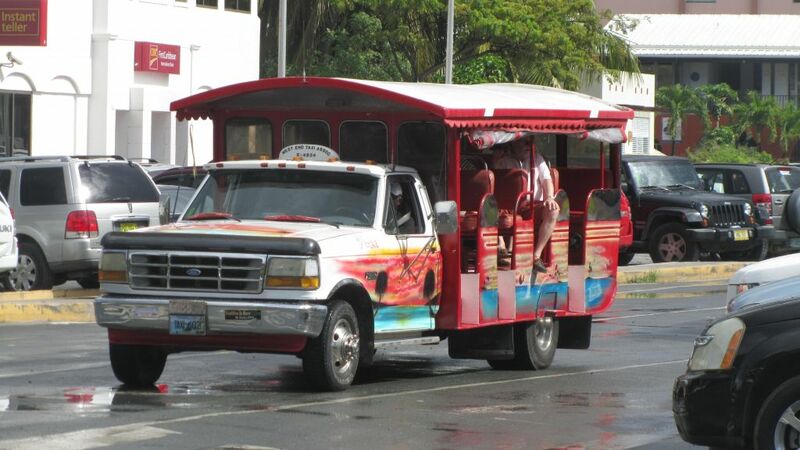 Tortola has the most peculiar Taxi’s … it was just something that we could not get … why do they use these huge Ford F350 utes/bakkies/pick-up-trucks with an extended base !!!??? … converted into an semi open taxi? 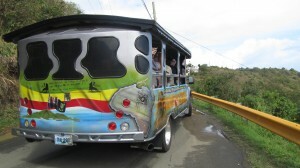 Well… after having done the island tour we know now why! 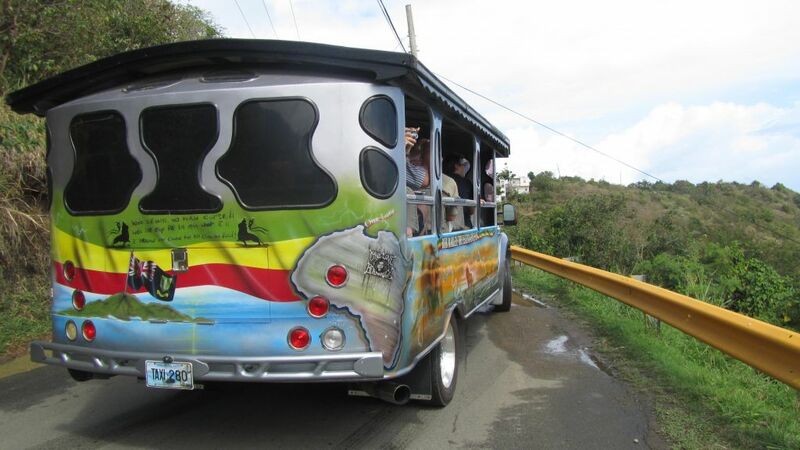 It is a very hilly island with amazingly steep narrow roads doing very sharp steep bends uphill …and the power of these vehicles is absolutely needed to get a load full of people up those hills! Although heavy on fuel … the need for power is more important! The roads are narrow and in poor condition (lots of pot holes!) and around every bend the tooters are announcing that you are coming around not matter who and what is on the other side heading straight for the same bend! OMW … it was pretty scary at times … I have learned not to look at the road and rather focus at the scenery! The houses on the island is massive … and the story is that locals owns it …have their home on the fist level and build up two or three levels to provide accommodation for tourists – they all look very well maintained – so we have to assume tourism is healthy and flourishing on this island. The vegetation is much lusher on top (but it is not a tropical island at all like we have seen in the Caribbean!) than around the coast line and it became pretty cold as we reached the 1800 ft above sea level . Most of the roads are hugging the coastline and it was great to drive past all the towns where we have anchored already – and see the ones we haven’t been to yet! The schools are well maintained and a lot of effort is going into designing really pretty school uniforms. There must be good support from the British government? Talking about the Brits…. 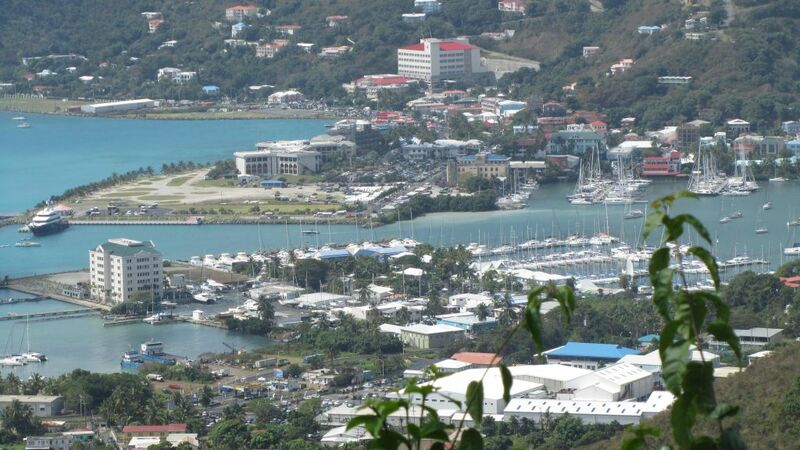 the BVI …being British territory … is strangely enough trading in US dollars! Weird … but it suits us Aussies …seeing that the Aussie$ is for a change stronger than the US$! The Wild one!!! 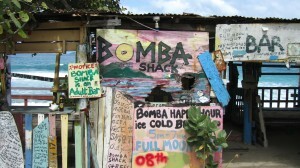 Bomba Shack... Full Moon Party ! The tour was well thought through! 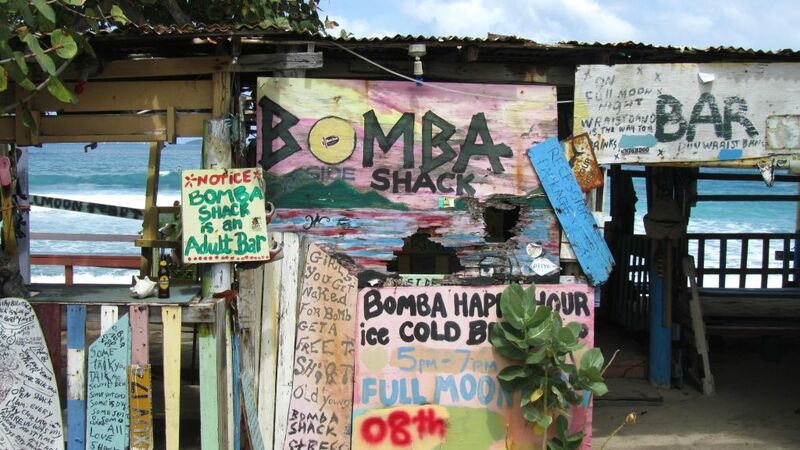 Calvin took us all the way over the top and all along the skirting of the island – showed us the highlights …like the Bomba Shack Bar!!! That is just one of the three venues for the Full Moon Party that was held on the 8th march! Well…this one (see the pictures!) is certainly THE WILD ONE!!! We gave it a miss … I think there is an age restriction of 28 anyway? Ha! The running commentary from the Taxi driver and tour leader (Calvin) was excellent and to top it all – he took us into town after the tour for some very needed provisioning and that is where we stocked up on our South African products too…Boerewors and Biltong, Mrs Ball’s Chutney and Some great Cape olives and Ina Paarman products! Tortola has so much to offer ….we will have to go back …. and I really hope to then make use of the opportunity to claim my birthday present from the Captain …. swimming with the dolphins! Dankie Henriette. Die fotos is pragtig. 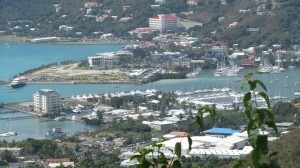 Ek sou nooit andersins geweet het van Tortola Island nie. Julle moet dit terdee geniet ! Het bietjie hier geloer en dit lyk of jul alte lekker rits. Wat ‘n wonderlike geleentheid! Die seisoen is besig om hier te draai. Die wingerde begin verkleur en die aandluggie is al koelerig. Jul moet lekker reis en ek hoop jul weer is heerlik die hele tyd.